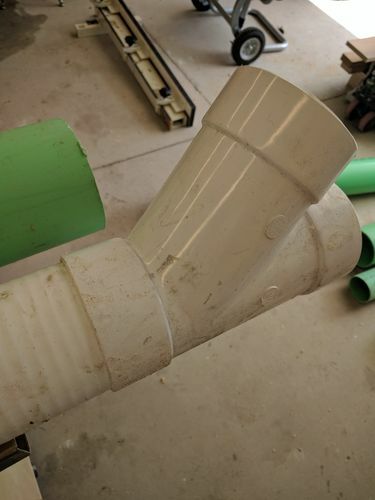 While needed some edits to my 6”/4” HVAC dust collection ducting, I wanted to tryout PVC instead of metal ducting since this will be laid upon the floor where it would have a likelihood of being kicked or dented. 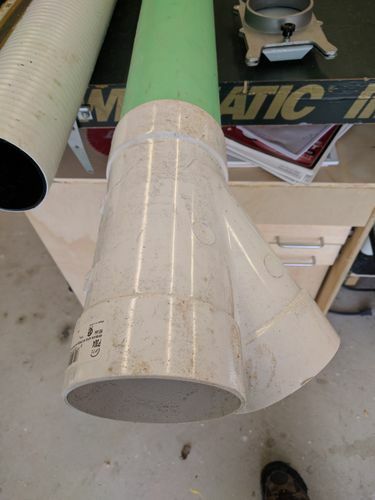 So I went to my local water/irrigation distributor to pick up some green PVC sewer & drain (SDR35) pipe. 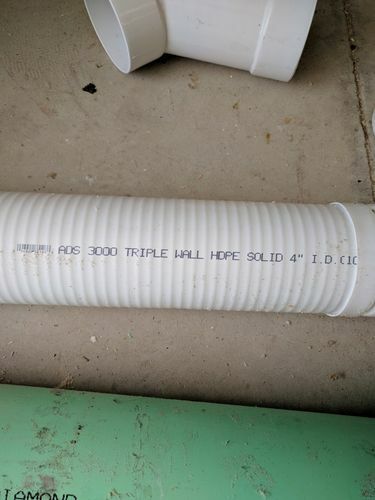 After telling the salesman what my purchase was for, he had me look at an alternative: Polypipe (aka Triplewall). 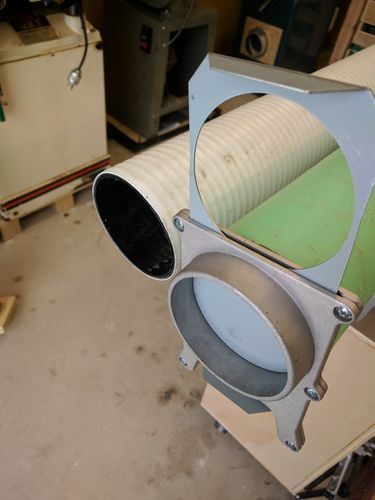 Reading up on Polypipe on the internet for dust collection duct, I was skeptical because everyone uses SDR for PVC, not Polypipe. So I bought 10’ for comparison against SDR. 1.) Polypipe has thinner walls than SDR with a slight rib on the interior by 1/32” or so while pronounced on the exterior. I do not think this would affect air flow, yet some research I read said it did. I would have no fear of the Polypipe collapsing either as compared to something like 28 gauge HVAC 4” duct. 2.) wye fitting. Of course the 4” wye fitting snugly fit upon the SDR pipe. When I tried the Polypipe, it also snugly fit but maybe 0.010” loose possibly due to the outside ribbing action. Acceptable in my book. This was my feeble test for outside diamter. 3.) blast gate fitting. I purchased some Powertec” blast gates instead of making my own this time around. 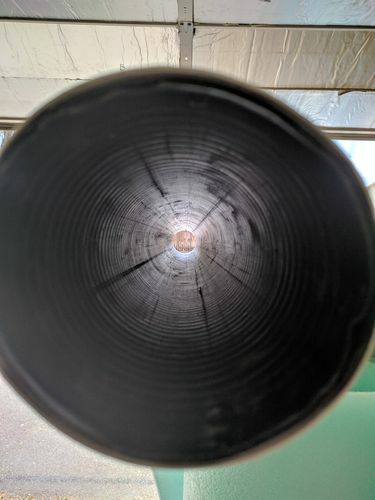 The fit perfectly inside the SDR pipe. Not so for the Polypipe. It is maybe 1/16” smaller. Tight enough to stay put, not so tight to be removed by hand. 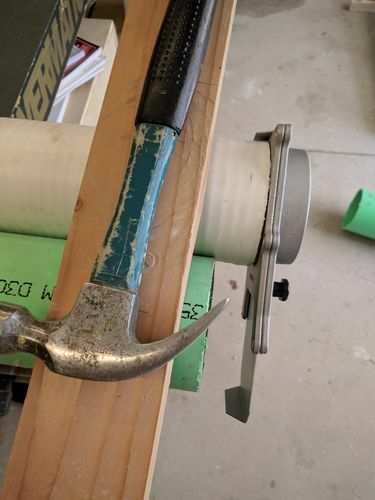 A couple taps with a hammer or rubber mallet is all that’s needed. Again, I think it’s the ribbing action for this cause. This was my feeble test for inside diameter. 4.) weight. Due to less material for the Polypipe, it sure felt less than SDR by almost 40%. I would not use it as it is clear that the internal ribs will cost you some flow and static pressure. If you have a powerful system with plenty of capacity then OK. if you are running a unit like the 2 hp HF ones, I would not use it. But, whatever works for you is great. Probably be easier and more accurate to measure static pressure. Measuring CFM is harder and the hand held anemometer are not very accurate. Yep Redoak…I saw no CFM difference in my cheapo anemometer across a 4’ piece of SDR and Polypipe. Will have to see how to to test static pressure. You think those dinky internal ribs have that kind of affect? I mean.. it’s really almost solid wall on the inside. Those ribs are less than 1/16” in height if that. I used that pipe for my 4” ducting when I had the HF dust collector set up and did some tests. I know that I would lose significant cfm over distance as it is because of the undersized impeller but from 15 feet to 30 feet I lost 25% cfm. If I could compare it to a smooth pipe I would have been able to been able to tell how much loss is from the blower and how much is from the pipe but I would guess that the ribbing on the inside plays a part in it. When I made the plunge to a larger dust collector, I went with the 6” smooth walled S&D. Good thing I only bought 10’ to test with. Can use portions for small things where 100% CFM needs are not mandatory. I posted a blog about using adaptor anemometer and you need to be really careful how you do it. I have another blog about making a water manometer to measure static pressure. Is it worth the effort to do the measurements? There is no doubt that the ribbed inside will perform worse than smooth pipe. Is it enough to make a difference in your shop….probably not.